State Congress president Yashpal Arya today asked the Nishank government to first make financial assessment of the damage in the state and then stake claim from the Central government. Besides the rains playing truant, it is the government apathy and reluctance to act on the warnings given by people that has compounded the misery brought on the people of Kumaon by the bad weather. Government representatives are now trying to defend themselves by saying that nobody could gauge that a disaster of such intensity would strike the area. Thirtyseven pilgrims of the last batch of the Kailash Mansarovar Yatra on its way back spent third day today at the Gunji camp as Air Force helicopters could not take sortie to Gunji due to bad weather. “The pilgrims will likely be airlifted by tomorrow,” NS Negi, District Magistrate of Pitthoragarh said. The catastrophe that struck Almora town on Saturday and left over 35 persons dead was not due to cloudburst but because of heavy precipitation of rain. Despite heavy rain and floods hitting the city for the past week, the enthusiasm of devotees celebrating the festival of Ganesh Mahotsava has not been affected. It seems the festival has worked as a revival force to the panic-stricken residents. At various temples, ashrams, colonies and establishments wherein grand idols of Lord Ganesha have been erected people turned up in large number for the immersion of Lord Ganesha idols today, on the last day of the festival. The Kumaon region continues to battle the fury of rains even as the administration has stepped up relief operations working round the clock. With rains lashing the region once again, ensuring connectivity through roads and supply of essentials continues to be the biggest challenge. The promises which vice-president of Garhwal Mandal Vikas Nigam (GMNV) Raghunath Singh Negi made to nigam employees, be it the 81 workers associated with the Mining Department, closure of a subsidiary company or supervisors/mangers of 91 tourist rest houses under the GMVN, have started showing tangible results. After three days of suspension, the railway traffic on the Dehradun-Haridwar section resumed today. This gave a sigh of relief to all passengers as well as to the railway authorities. After clearing the landslide debris near the Haridwar tunnel, the up and down trains were given a green light. While inching closer in its case against former Adviser to the Chief Minister and former Chairman of Uttarakhand Jal Vidyut Nigam Limited (UJVNL) Yogender Prasad for giving undue favour to a private company, Messers Shring Construction, with project work worth Rs 25 crore and thus benefiting himself as well, the Vigilance Commission searched his palatial mansion in E-118, Saket Colony, at Ajabpur today. Local traders met Nagar Palika president OP Uniyal to discuss the speedy development of the town yesterday. The Mussoorie Traders Association, led by association president Rajat Agarwal, raised issues like developing Landour as tourist destination by establishing a cable car from Landour to the Cantt area or elsewhere. Agarwal said the beautification of the Mall Road extending to Landour should also be initiated. New picnic spots like Mossy Fall and Bhatta Fall should be developed for the tourists. The traders also demanded that a Jhoola Ghar should be converted into a junk food market. Mayor Vinod Chamoli left a meeting of the working committee in a huff on BJP councillor Babita Sehrotra’s remark. Sehrotra allegedly pointed out the propensity of the Mayor to take one-sided decision without bothering to consult the councillors. The issue of establishing Gyan Godri Gurdwara at its original place at Har-ki-Pauri is getting deeper into controversy with on one hand the local Gyan Godri Committee agreeing to raising the gurdwara at an alternative site while on the other Sikh groups led by Baba Bhachan Singh, being adamant on setting up the gurudwara at Har-ki-Pauri only. Today, many Sikh youths from Punjab and Delhi protested and performed Ardas. State Congress president Yashpal Arya today asked the Nishank government to first make financial assessment of the damage in the state and then stake claim from the Central government for financial assistance. “Though Uttarakhand requires immediate financial assistance in the wake of the natural calamity, rather than coming up with exaggerated claims, the BJP government should make a fair ground assessment so that the Central government can process it. The BJP government should focus on providing relief and speeding rescue operations so that the affected people get relief,” said Arya at a press conference today. He said 104 geologically sensitive villages of nine districts need immediate attention. He also appreciated the efforts of the Congress supremo, who carried out an aerial survey of the flood-affected areas. “The promptness has encouraged us and I have asked all Congress workers to actively participate in the relief operations. The entire infrastructure of the state is in shambles as a consequence of paralysed transportation system, damaged potable water lines and collapsed electricity lines,” said Arya. Meanwhile, Union State Minister for Labour and Employment Harish Rawat said assistance to the injured was already being given form the Prime Minister’s relief fund and further assistance would be provided to the state as per its needs. More than 500 Char Dham Yatra pilgrims have been stuck at Nainbagh and Suman Kyari due to the blocked road at Kharsaun Kyari. The same road was blocked earlier was opened this morning but it was closed once again as more than 50 metres road was completely wiped out due to heavy rain in the evening. The stranded pilgrims are also facing accommodation problem, as the places being small hamlets do not have extra shelter. The locals are helping the pilgrims by providing shelter in their homes. Besides the rains playing truant, it is the government apathy and reluctance to act on the warnings given by people that has compounded the misery brought on the people of Kumaon by the bad weather. Government representatives are now trying to defend themselves by saying that nobody could gauge that a disaster of such intensity would strike the area. But, this explanation is not going down well with the people who once again stand at the receiving end. There are a series of pointers that confirm this. It has been noted that day to day warnings coming in the forms of memorandums being handed over at administrative headquarters by villagers across the region have simply gone unheeded. Every second day there have been reports over the past eight months saying that the villagers have raised issues of threats to lives from hanging electricity poles, transformers going out of order, chances of tracts of land sinking and rivers overflowing the broken embankments. But there have been less examples of the administration heeding to the demands raised by the villagers. Now, when the disaster of a greater magnitude has occurred, the government is taking refuge in the excuse that nothing can prevent a disaster of such a magnitude. Chief Minister Ramesh Pokhriyal Nishank when confronted with this question has been evasive and defends his government and the state administration by stating that there may be some cases of such requests going unheeded but the administration does act on such requests promptly. “There can be a few such cases but I do not agree that the administration has not been responding,” he said. An interesting example to be quoted here is that of the Sukhatal area of Nainital being water logged. Over the last one decade a full-fledged residential colony has sprung up in the lake bed right under the nose of the administration. It makes one wonder how the administration could allow a residential locality to come up and sustain in a re-chargeable lake and now when the place is water logged a hue and cry is being raised. Another issue being raised at various forums is the effectiveness of the Disaster Management Cell in the state. There is a perception in a large segment of the population that the department is good enough only for holding workshops in plush hotels and the Administrative Training Institute (ATI). The present times have proved once again that the department still stands ill-equipped to tackle disasters. Sources have pointed out that at times of disasters the personnel do not have things like candles, torch and ropes readily available to them. A contractual post at the district level to deal with disaster management stands vacant and the cabinet minister Madan Kaushik had no explanation to give during his recent visit why the post was lying vacant. All he could say was that any post which has been sanctioned and is lying vacant would surely be filled. According to the district administration, the Air Force helicopters had to fly to Gunji to lift the pilgrims before noon today but due to heavy rain at the Bareilly base they could not take off. “In the afternoon, two air force helicopters reached the Pant Nagar air base but due to heavy rain at Pant Nagar and at Gunji they had to cancel their sortie,” said Negi. According to the District Magistrate of Almora, the Air Force has also promised the Almora district administration to airlift essential goods to Almora town from Haldwani as the main highway linking Almora and Haldwani has been blocked for the past five days and a shortage of essential goods has been felt place in Almora town. “The four Air Force helicopters assigned at the Bareilly base to cope with the calamity in this region are giving priority to airlift the persons stranded in flooded areas of Moradabad and Bijnore districts after that they will come to airlift the pilgrims and bring supplies to Almora town,” said Almora district officials. This was stated by a team of geologists of the state government who are studying the geological reasons of the Almora tragedy, along with Sumgarh and the Qurie-Jimia incidents. “While the landslides at Balta and Bari villages of Almora were out come of heavy rains, same reason caused landslides at Sumgarh in Bageshwar district. The case of Qurie-Jimia of Munsiyari was different, here and the land erosion was due to the displacement of geological faults inside soil,” said Dr Rajendra Shukla, a geologist with the state government at Almora. The geologist, after studying preliminary reasons of the Almora tragedy, said when the rain exceeded the limits the moisture of land increased and became more than the absorption power of the soil it slid according to the slops available there. “After more rains, the persistence capacity of the land decreases and it slides speedily,” said the geologist, adding that in Almora and the Sumgarh area of Bageshwar this tendency of soil caused the landslides. The geologist team, which has been ordered to prepare the report on Almora and Sumgarh tragedies, lacks staff and infrastructure to speed up their work. “We have only two geologists working in Kumoan, one at geologist level and another as assistance geologist posted in Haldwani and have no infrastructure to prepare the geological report of six districts of Kumoan, ” said Dr Shukla. The geologists say that the time has come to carry a comprehensive study of all towns and villages of the state showing sensitivity to landslide from the teams from IIT, Roorkee, and the Indian Remote Sensing Institute to establish which area is suitable to construct the houses and up to which heights these can be constructed. “As the Nainital Lake Development Authority regularising the house construction in the lake city, the same type of authorities need to be constituted at Almora and other towns of the state to regulate the unscientific construction of the houses here,” said Dr Shukla. Despite heavy rain and floods hitting the city for the past week, the enthusiasm of devotees celebrating the festival of Ganesh Mahotsava has not been affected. It seems the festival has worked as a revival force to the panic-stricken residents. At various temples, ashrams, colonies and establishments wherein grand idols of Lord Ganesha have been erected people turned up in large number for the immersion of Lord Ganesha idols today, on the last day of the festival. Along with huge idols of Lord Ganesha, accompanied by tableaux, youths danced throughout the procession spraying colours on each other. 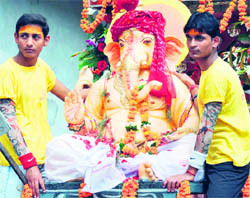 Residents were lined up on sideways to touch the ropes pulling the Lord Ganesha idols. Meanwhile, the processions led to huge traffic jams in the city. Particulary at the Chandracharya Chowk, Rishikul, Devpura, Shiv Moorti till Har-ki-Pauri and adjacent ghats, traffic moved amid chaos. With Gang Nahar closed due to silt accumulation, the idols were taken to the Ganga for immersion. “Bal Gangadhar Tilak, while conceptualising the Ganesh Utsav had in his mind to unite people, particularly Maharashtrians, but now it seems slowly the festival is uniting the whole of India,” said Nitin, a local shopkeeper. The residents of Almora have been provided some succour with the restoration of water supply to about 50 per cent of the town the remaining 50 per cent continued to be without water for the fifth consecutive day. The efforts of the government to fly in relief through a helicopter from Udham Singh Nagar proved futile, as the weather conditions did not allow execution of the operation. However, the silver lining visible was opening of Almora-Lamgarah and Almora-Ranikhet-Ramnagar roads. The administration is now trying to bring in the essentials commodities through these routes. A spokesperson for the district administration said the administration had started numerous camps in different blocks where free food grains and tents were being made available to the residents. Meanwhile, the first major signs of damage have started becoming visible in Nainital town in the form of boulders landing on the premises of Birla Vidya Mandir in the Snow View area. The school administration has already suspended teaching in the institution for 10 days and the buildings have been vacated. Extensive repair works have been undertaken by the management. A portion of the road inside the premises has been badly damaged because of a landslide and cracks have appeared on another stretch of road. On the other hand District Magistrate Shailesh Bagauli undertook an on the spot inspection of Ramgarh Block. He ordered the revenue officials to evaluate the losses incurred by the residents in the form of extensive damage to more than a dozen houses and asked them to provide instant relief to the victims. He also asked the Executive Engineer of the Public Works Department (PWD) to instantly get the roads repaired on which cracks had developed. Bagauli heard the problems of the villagers and directed the officials of the Civil Supplies Department to ensure supply of food grains and other essentials by evening. In fact, the supply of essentials continues to be an issue of concern in the remote areas of Pitthoragarh, Champawat and Bageshwar districts. On the other hand, parts of Terai continue to battle the problems emerging from continuous flooding and water logging. The 81 employees, who were grappling with the insecurity of seasonal work of mining, had been put on training to gain proficiency in various streams of the tourism sector with a noble cause to end the insecurity and instability in their profession. “A Delhi-based hotel management company is providing basic training to these 81 employees in different wings of the hospitality sector. Before that, they had been tested on the scale of their skills and capabilities and accordingly chosen for the different capsules of training. Once fully trained, they would be absorbed in different departments. This will end the long spell of the insecurity in their profession,” said Negi. The decision to impart them training for their further absorption in the nigam was taken in the board meeting held quite recently, he added. The employees are though not happy about the fact that they had not been given salaries with the raise of Rs 2,000 for Grade III employees and Rs 1,200 for Grade IV employees from August onwards. Clarifying his position, Negi said the Secretariat had to give formal approval to this decision, which in his knowledge, had been given. He hoped that the employees should get the raised salaries in the beginning of October itself with a cumulative effect. 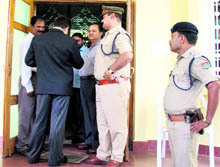 The Supervisors and Manager Association of the nigam too is getting fidgety over the inertia being shown to their demand to remove seven new appointees, who, according to them, had been appointed in unfair manner in July this year, showing disregard to the long experience and high qualification of much deserving nigam officials. SP Khankriel, manager stationed at Dhanaulti, said by next week, their association was going to meet both president and vice-president to meet them in this regard. “The state government had taken a serious note of this issue and had set up a committee to probe the veracity of appointments which must be declared soon,” Negi informed. 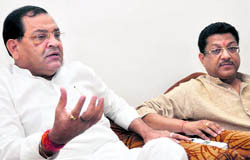 He also talked about those 20 employees whose future hanged imbalance because of the closure of the GMVN SC/ST company, a subsidiary company of the GMVN, to which they were associated saying, “These are the employees who despite enforcement of the Sixth Pay Commission are getting wages as per the Fourth Pay Commission. We have demanded Volunteer Retirement Scheme facility for those above 50 years and assimilation in other departments for ones below 50 years. Very soon, we will be able to come up with a concrete decision about their matter as well”. 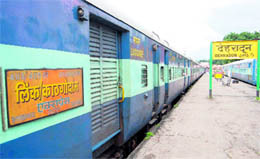 Train services from Dehradun to other destinations via Haridwar were suspended for three days as a result of incessant rain. The water logging and mudslide on the railway tracks at Haridwar had caused inconvenience to the train commuters. All trains were terminated on September 19. SP (Vigilance) BK Juyal said the department received many valuable official files and documents from Prasad’s house, which would be of a great help to further probe the case against him. Beside, the team could also lay its hands on several bank account numbers he possessed and the documents related to his property details. Juyal said the department could not reveal more in this case at this stage. The traders also highlighted the deplorable condition of the toilets in the town and demanded to deploy more employees to clean these regularly. Uniyal assured the traders that their concerns would be considered on priority basis. He said he was immensely concerned with the development of Landour, especially the Clock Tower. He said the money being collected under the Eco-Tax would be spent on the solid waste management and segregating garbage and had directed the Executive Officer to instruct the hoteliers to make two dustbins and if they failed, there hotel licence should not be renewed at any cost. Uniyal said identification of the temporary vendors and horses would begin from November and only those residing permanently would be accommodated in the development projects. The Palika is also planning to buy JCB and utility to address the problem of roadblocks due to mudslide. And it’s also considering the shifting of vegetable market from Anupam Chowk to below the Civil Hospital, said Uniyal. Association president said he would oppose such move of the Palika. He said the plans of providing 30 shops to the businessmen were faulty as only rich businessmen would avail these shops not the poor ones, furthermore it would lead to more temporary encroachment. The woman councillor seemed peeved at the leniency shown to the some hotel owners in the matter of house tax. Sehrotra made the scathing remark saying that Chamoli seemed more kind on wealthy and influential people and less benevolent on the poor strata in the matter of house tax. She exchanged a bitter argument with him which ended in Mayor’s abrupt exit from the meeting. The committee were discussing the self-assessment house-tax provisions in the meeting. The issue of establishing Gyan Godri Gurdwara at its original place at Har-ki-Pauri is getting deeper into controversy with on one hand the local Gyan Godri Committee agreeing to raising the gurdwara at an alternative site while on the other Sikh groups led by Baba Bhachan Singh, being adamant on setting up the gurudwara at Har-ki-Pauri only. 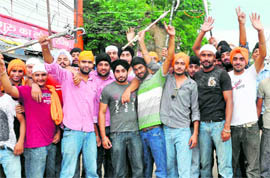 Today, many Sikh youths from Punjab and Delhi protested and performed Ardas at local gurdwara. National coordinator Indra Singh Chug has once again reiterated their stance and resolution taken at the Nanakpura convention held on September 18 of building the gurdwara at its original site only. Speaking to The Tribune, Chug cited example of Ramjanmbhoomi, pointing out that as the Hindus wanted the construction of the Ram temple at the very site itself, notwithstanding any other site proposal in the same way sentiments of the Sikh community are attached with the religious significance of Gyan Godri Gurdwara. Guru Nanak Dev himself did a ‘sadhna’ at the same place. “We condemn the proposal of the local Gyan Godri Committee toeing adminstration’s line of having the shrine at any other place. A few people having their interests with local government can’t be accepted to have a stance on an issue having relevance with millions of Sikhs worldwide,” said Chugh. Gurcharan Singh Babbar, president of the All-India Sikh Conference (Babbar), said Sikh’s had the right to have the gurdwara at the same place.